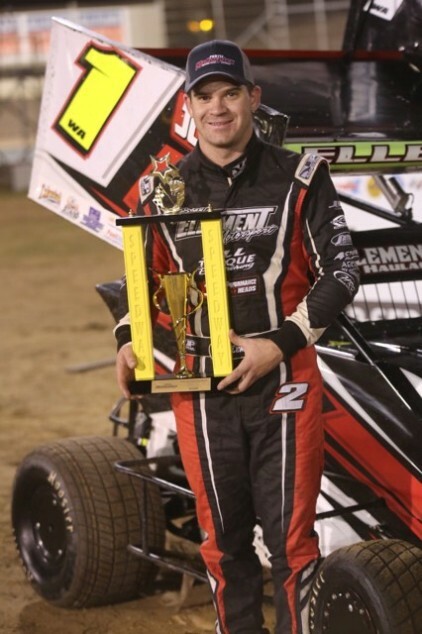 FORMULA 500s -Ellement Breaks the Drought! 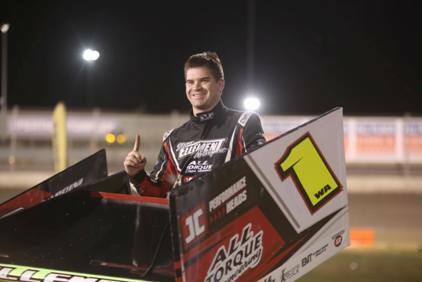 As the feature race went green, Ellementwent immediately into the lead while Luke Nardini got the jump on position two starter Cody Turacchio to grab second. Nardini used the inside line, Turacchio the outside and the two were side by side for the first lap and a half until Nardini stuck the nose in front to be a clear second place. Up front Ellement was beginning to pull away from the chasing duo, which quickly became a chasing trio as Chris Dymock closed the gap and sat on Turacchio’s tail tank looking for a way through. Trent Korthius became the first retiree of the race on lap three, while on track Ellement was extending his lead to nearly a second on Nardini, who had also started to pull away from Turacchio and Dymock. Cameron Mckenzie was leading Jamie Nardini, JyeMckenzie and Greg Edwards as the only others on track. As the laps wound down Nardini began to peg back the gap, setting the fastest lap of the race on lap eight and closing the gap to just over half a second, the next lap the gap down to less than half a second. The rest of the field was spread out like the proverbial Brown’s Cows until Greg Edwards was able to pass JyeMckenzie after some solid laps before Mckenzie became the second retiree. Back up front Ellement was still holding off Nardini and would go on to claim the win despite a last gasp effort from Nardini, while Turacchio would be third. 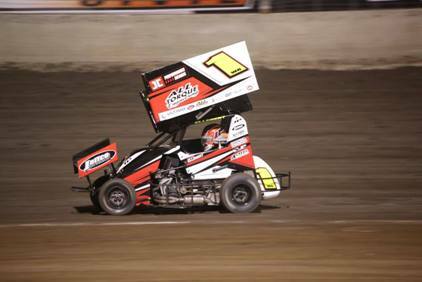 Courtesy of tonight’s results, Cameron Mckenzie has now taken over the lead of the Perth Motorplex Track Championship after previous points leader Glenn Carstairs failed to start the feature with mechanical dramas. Carstairs is just one point behind in second place while Chris Dymock is only twenty four points further back in third place. 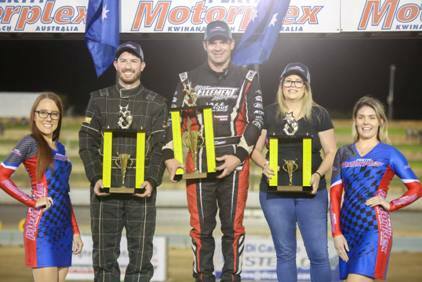 The Formula’s next show will be at the Perth Motorplex on the 30th of March for the Retro Night/Silver Cup double! Heat One, 8 laps: 1. Steven Ellement, 2. Cody Turacchio, 3. Chris Dymock, 4. Luke Nardini, 5. Cameron Mckenzie, 6. JyeMckenzie, 7. Jamie Nardini, 8. Greg Edwards. DNF: Glenn Carstairs (6), Trent Korthius (2). Total Time: 2.12.533. Winning Margin: 1.528. Fastest Lap: 16.406 Steven Ellement. Heat Two, 8 laps: 1.Luke Nardini, 2. Cody Turacchio, 3. Steven Ellement, 4. Chris Dymock, 5. Cameron Mckenzie, 6. Jamie Nardini, 7. Greg Edwards, 8. Trent Korthius (7). DNF: JyeMckenzie (4). DNS: Glenn Carstairs. Total Time: No Time. Winning Margin: 0.770. Fastest Lap: 16.260 Luke Nardini. Feature, 15 laps: 1. Steven Ellement, 2. Luke Nardini, 3. Cody Turacchio, 4. Chris Dymock, 5. Cameron Mckenzie, 6. Jamie Nardini, 7. Greg Edwards. DNF: JyeMckenzie (11), Trent Korthius (3). DNS: Glenn Carstairs. Total Time: 4.03.841. Winning Margin: 0.451. Fastest Lap: 16.050 Luke Nardini.